1 drawing on paper : color pencil ; image 7.375 x 10 in., on sheet 8.5 x 11 in. 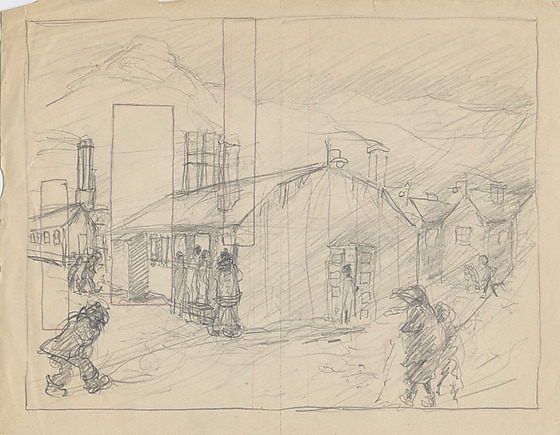 Pencil drawing of inclement weather in United States concentration camp during World War II. 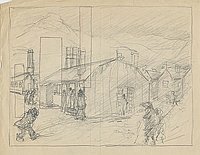 Central image is rain swept mess hall with people standing and looking in through windows and doors ; smoke issuing from chimneys. Dark figure bent against rain, lower left corner ; two figures walk toward mess hall, lower right corner. Barracks with smoking chimneys visible in background ; people walking in rain. Mountains visible in distance. Rectangular line border ; three vertical rectangles overlay images on left. Pink pencil lines accenting certain lines.